I bought these as a cheaper heatsink solution, although they would require a little extra thought and work to use. I bought four of them from ebay. 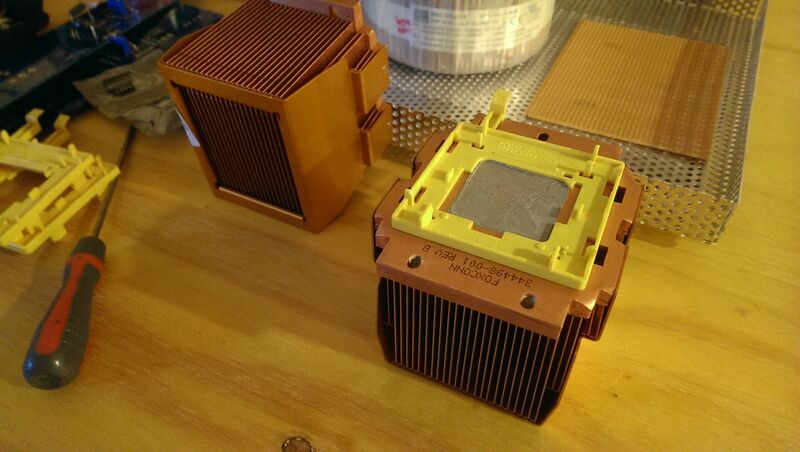 They were described as "Foxconn HP 344498-001 Proliant Server DL380 G4 All Copper Heatsink". They measure approx 90x80x60mm. I had to remove that piece of plastic and old thermal goo (easy). 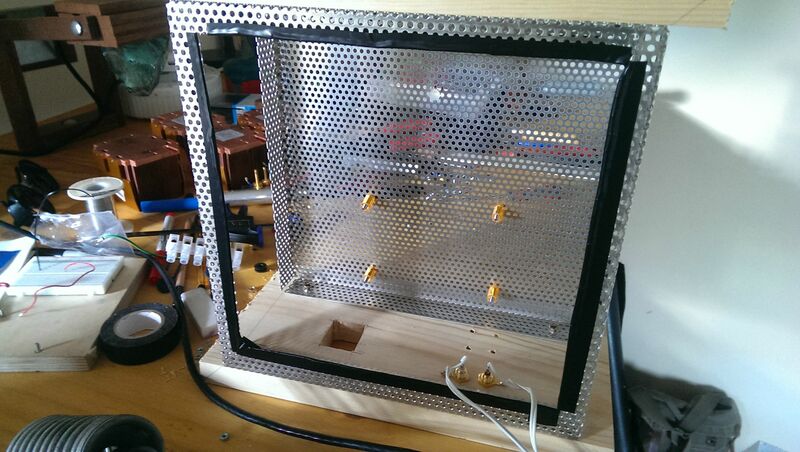 The base of the heatsinks already had various holes. 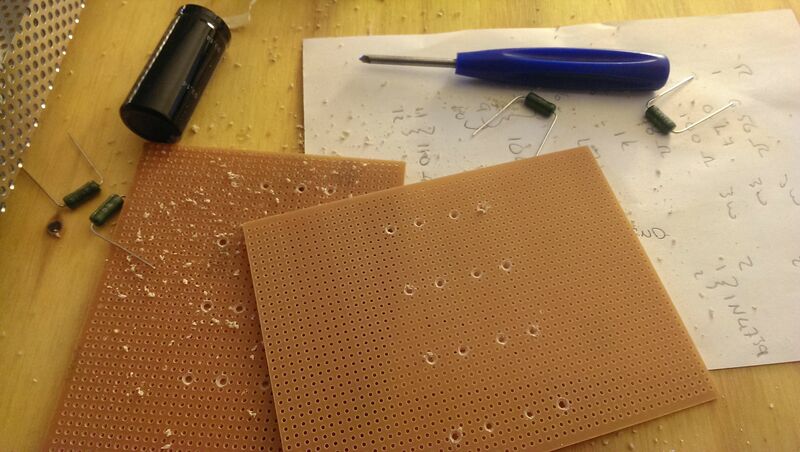 I planned to use one of the inset holes to fix a mosfet. 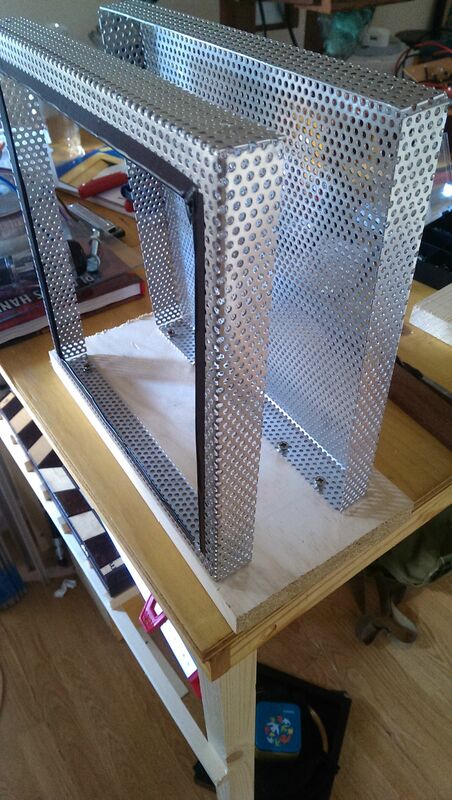 The holes were M3, which conveniently matched up to the holes in the metal I used for the chassis (later). This was all point to point, so I wrapped the legs along and soldered them. This is the wire that will earth the chassis. With the resistors and capacitors in, I used 14AWG wire to make all the connections. 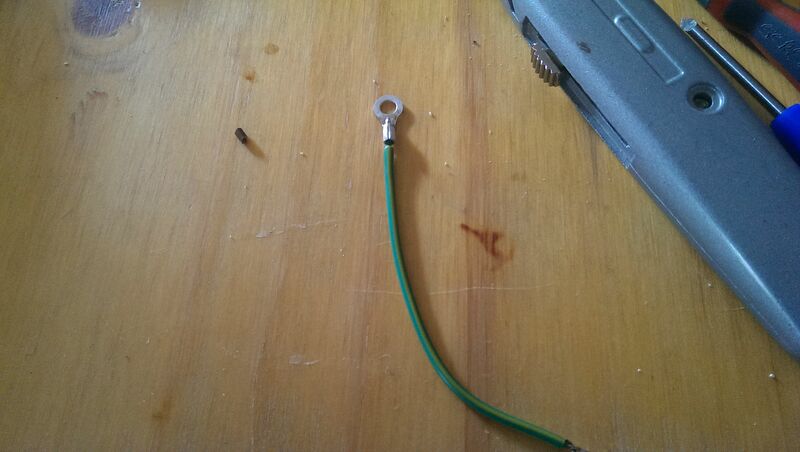 14AWG was a bit overkill and was actually tricky to use. I cut a length, and then removed sections of the insulation at the points of the required connections, and then pushed the capacitor pins through the expose wire bundle. Colours; we have red and black coming from the full bridge rectifiers, but these are then aligned for +24v 0 -24 volt (see earlier schematic). The middle circular ground comes out the other side as a solid green wire, which is later connected to earth (yellow and green striped). This photo is missing two more black/red pairs, which breaks out the +24(red) and -24(black) to go to the PCB channels. 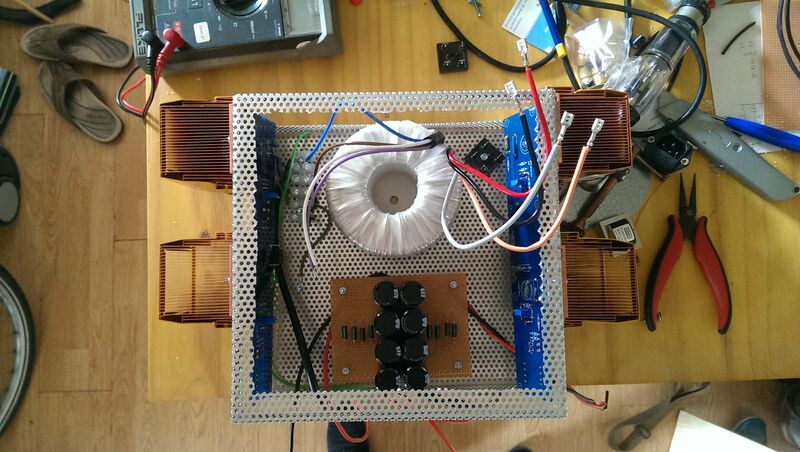 The large circle is a torroidal transformer which will be wired to 240vac and lead to rectified 24vdc. You can see the earth wire connected to the chassis. The power supply filter circuit, and the black cable on the left is the mains supply. I picked up the chassis material from some extraction units I found in a skip. I grabbed two pieces, and it measures 250x250mm, with ~20mm tall folded edges. 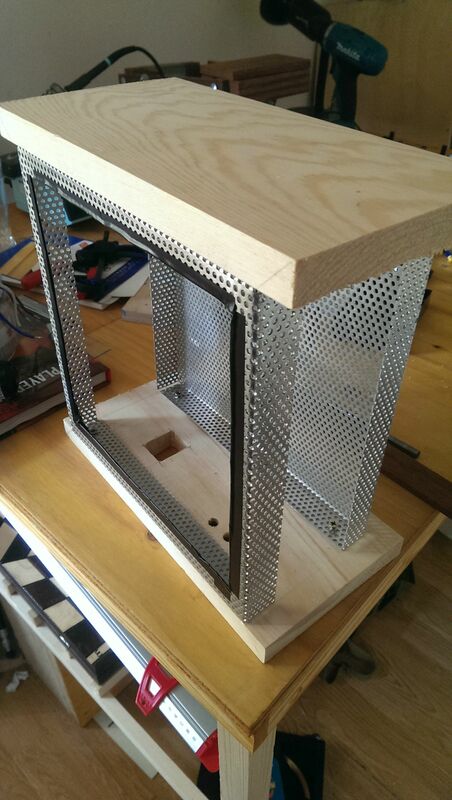 It is aluminium perforated with 3mm diameter holes. The original plan was to solder the mosfet to the PCB (where the 3 large pads are) and then mount directly to the heatsink. However, the PCB was the same length of the chassis plate, and so the heatsinks over hung and did not sit equidistant across the chassis length. 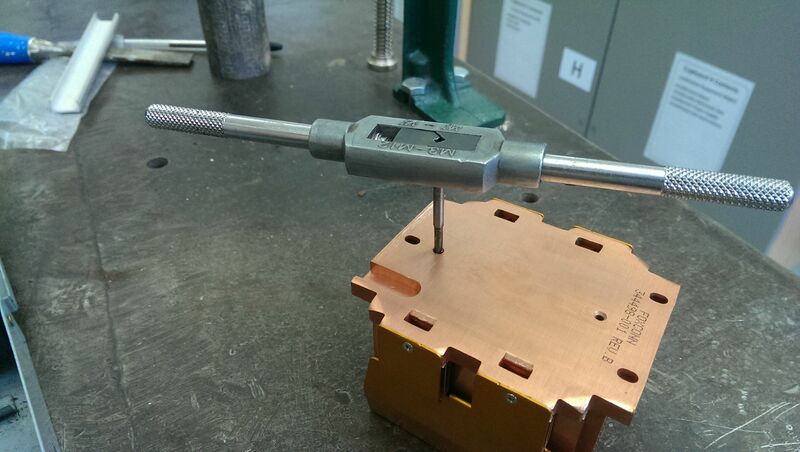 Checking for a collision between the tapped M3 hole for the mosfet and the chassis, all clear - luck! Another picture of the mosfet fit. 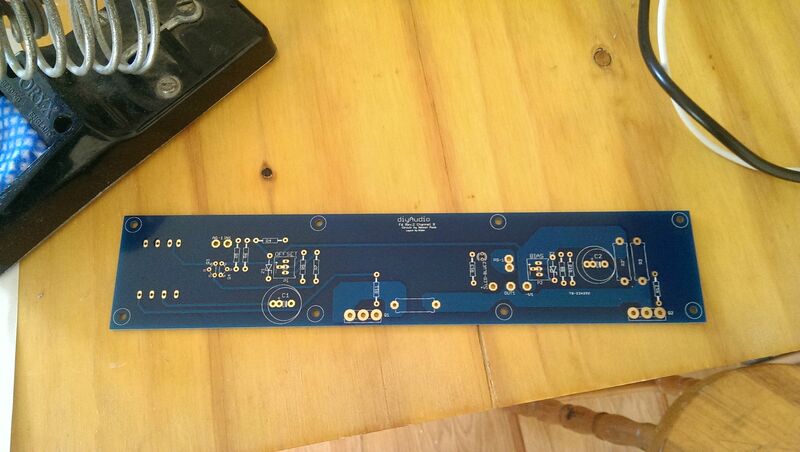 Here you can see the heatsink placement if the mosfets are soldered directly to the PCB. I really didn't like the spacing. In this photo I was just testing if the transformer was wired correctly. 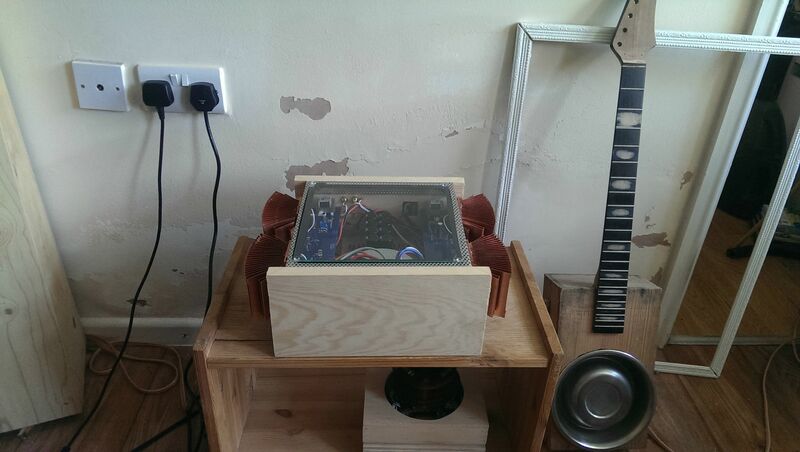 It had two primary windings, which had to be wired in series to handle UK mains voltage. I later did another test with just the PSU filter wired in and checked for the correct rectified voltages (two output windings). I bought a plank of 140x20mm pine to use as the front and back plate of the chassis. 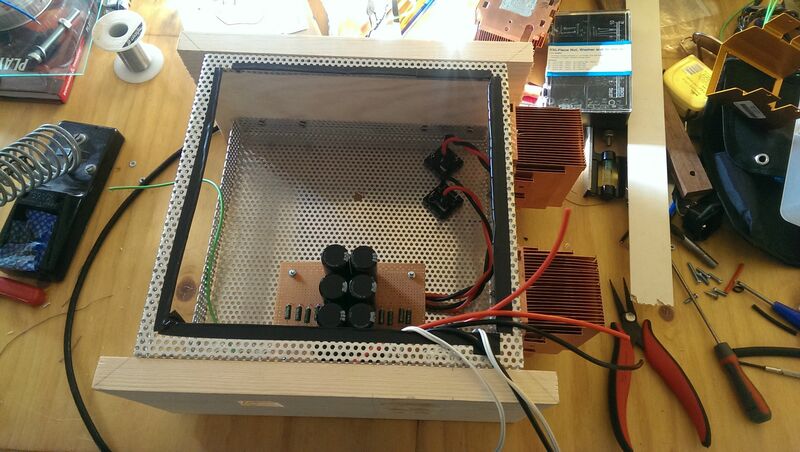 The top and bottom aluminium will be electrically connected through the heatsinks - but not live, earthed. I cut most of the top chassis plate away to allow access. I started doing this with a copin saw, and broke a blade. It turns out the aluminium is soft enough to cut with a substantial pair of snips. The PSU filter needed to be lifted from the chassis. I didn't have an riser posts to hand so I used a biro cut into short lengths. The screws are M3 throughout this build. 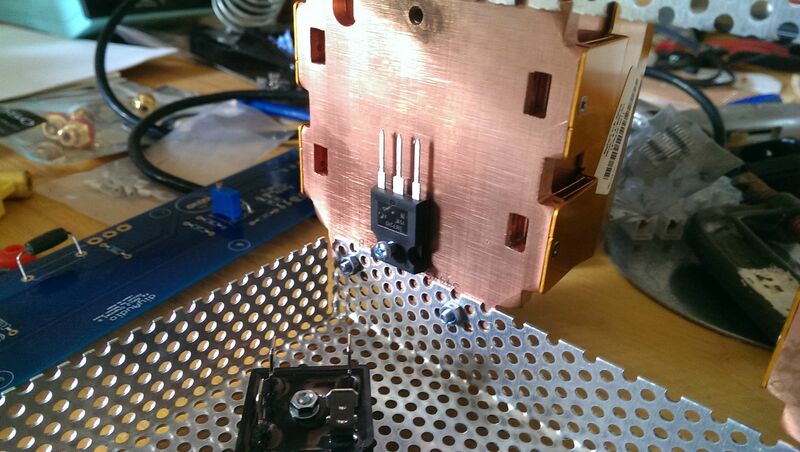 The mosfet fixed to the heatsink. 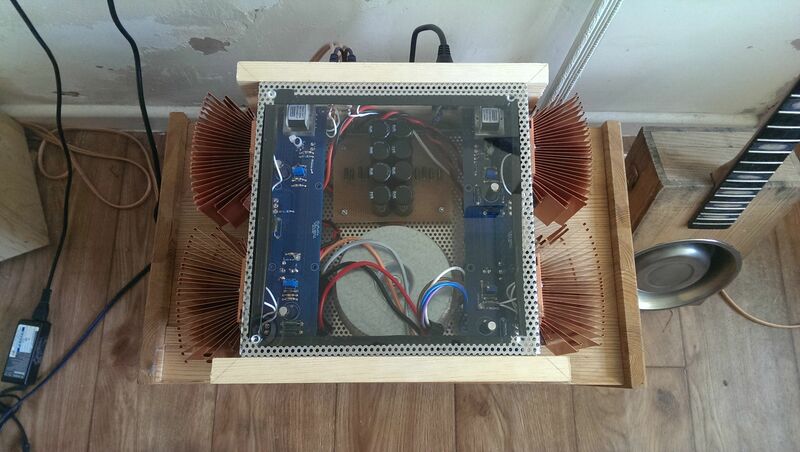 I cleaned the heatsink with white spirit first. Then a layer of thermal goo. Then a mica square to electrically insulate the mosfet. 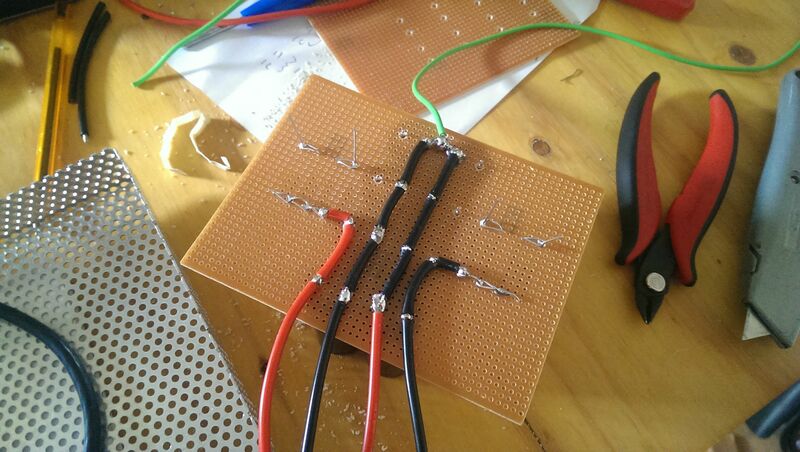 I used a mica plate designed for TO-218 packages, which gave lots of extra mica to insulate around the mosfet. Then another layer of goo, then the mosfet. There is a small stack of washers to go from M3 to the large washer, which applies even pressure and acts as a heat spreader for the top surface of the mosfet. 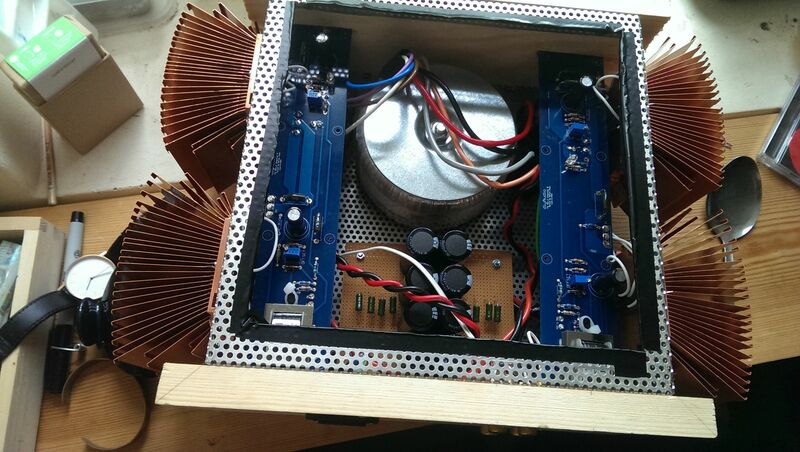 The PCB's had to be installed through the side, which was quite a fiddle. They didn't fit by a mm, so I had to drill out a channel in the face plate. 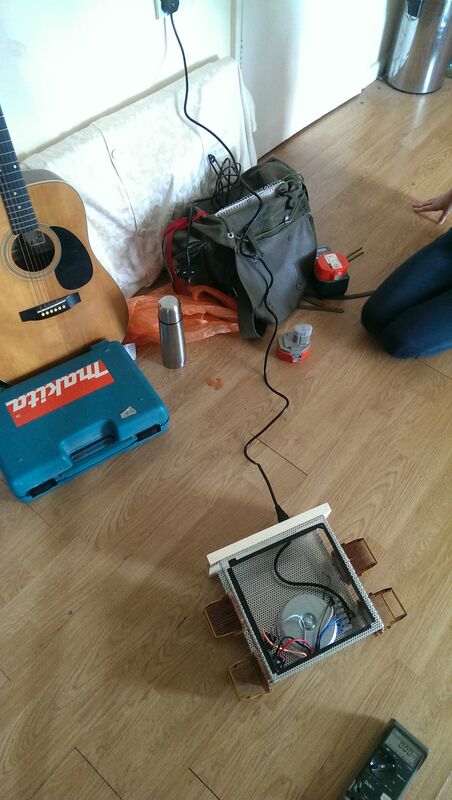 I don't have a router, so I clamped a piece of wood to the surface and drilled at the interface between the two. You can also see a row of screw-terminal connectors. This is the mains power distribution and earthing point. Its good to have your ground connections all located in one place (a star configuration) to stop ground loops, which can cause unwanted and audible hum. 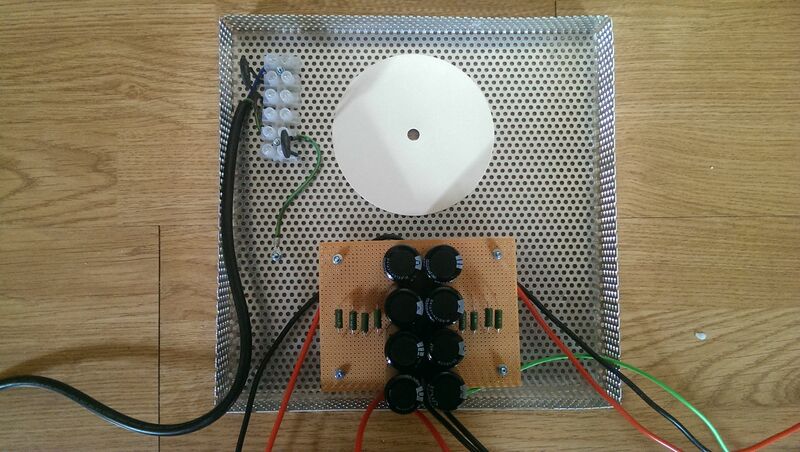 The little black discs are thermistors, used here to limit the initial current flow to the amp. They lower their resistance as they warm up - I thought this was particularly interesting. 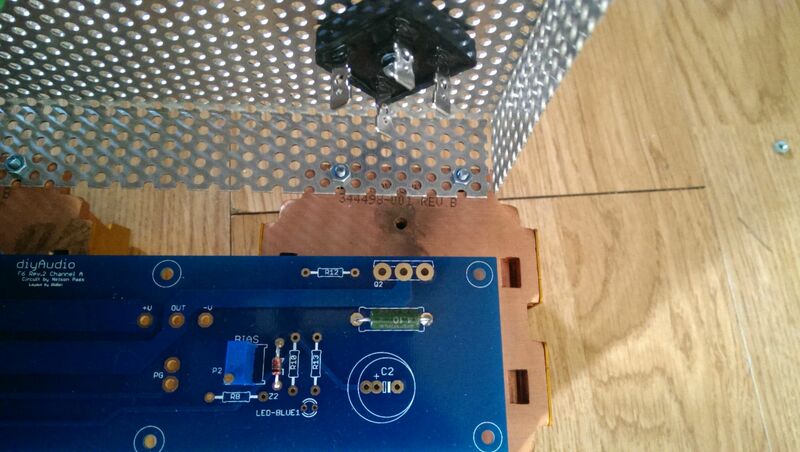 I had decided not to mount the mosfets directly to the PCB so another solution was required. 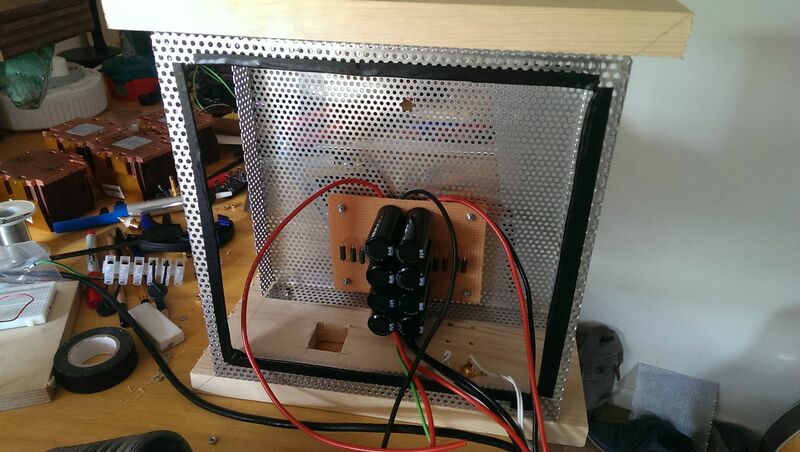 Soldering wires to the mosfet legs wasn't going to work, it was too fiddly. Instead, I used the female receptacles for JST connectors, which conveniently accept the mosfet legs perfectly. 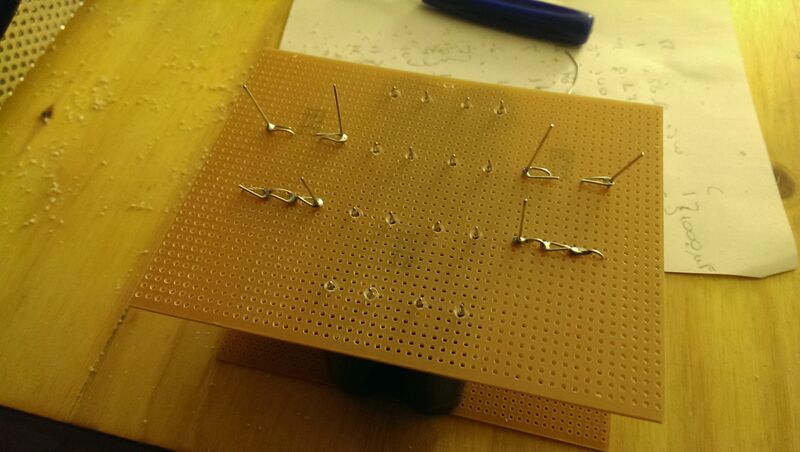 I could have soldered these, but I decided to leave them unsoldered in case a dissassembly was required. 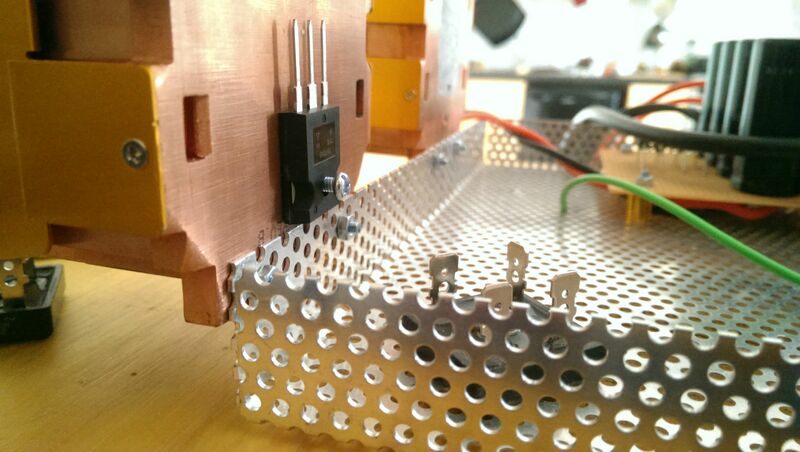 The PCB was eventually lifted level between the drilled channel and a small shelf on the back pannel with some scrap wood. 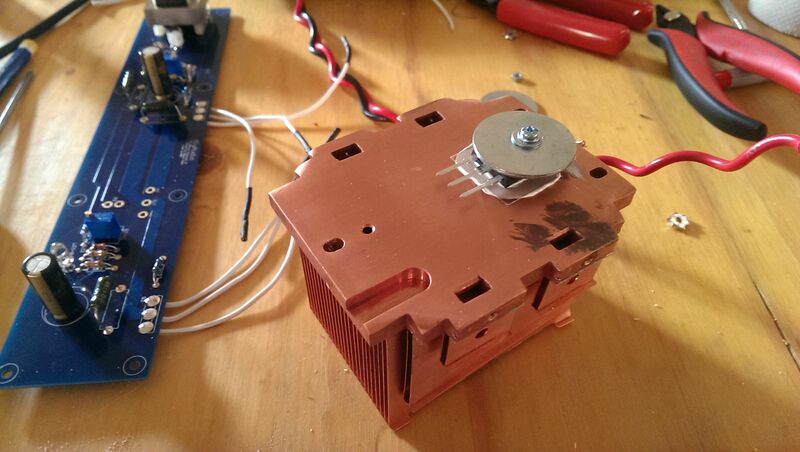 After running the amp for the first time, it became apparently the heatsinks weren't radiating quickly enough. So I used the flat metal handle of a spoon to go between each heatsink fin and bend it out. 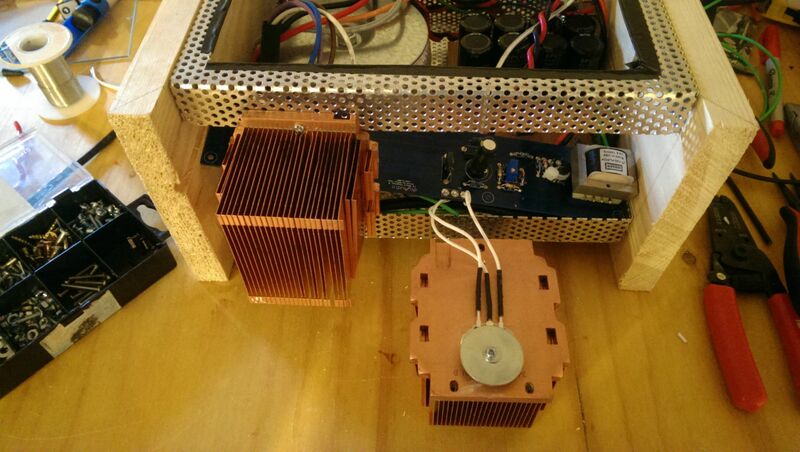 This increased the air gap, and the heatsinks are much cooler in operation. 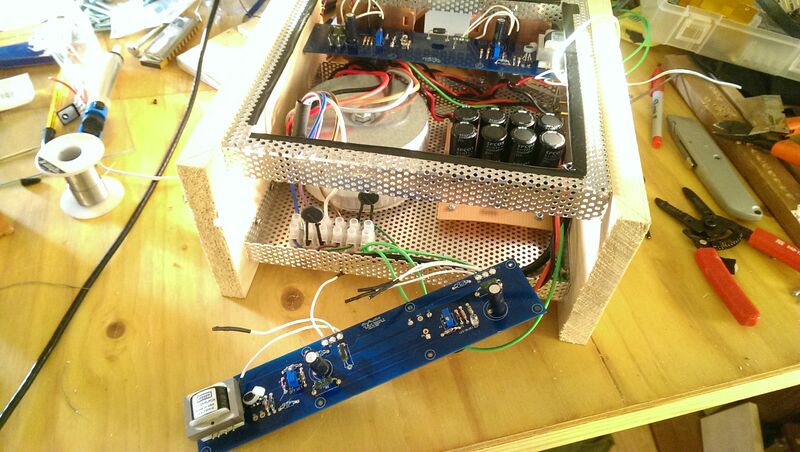 The amp has a few pots to tweak. 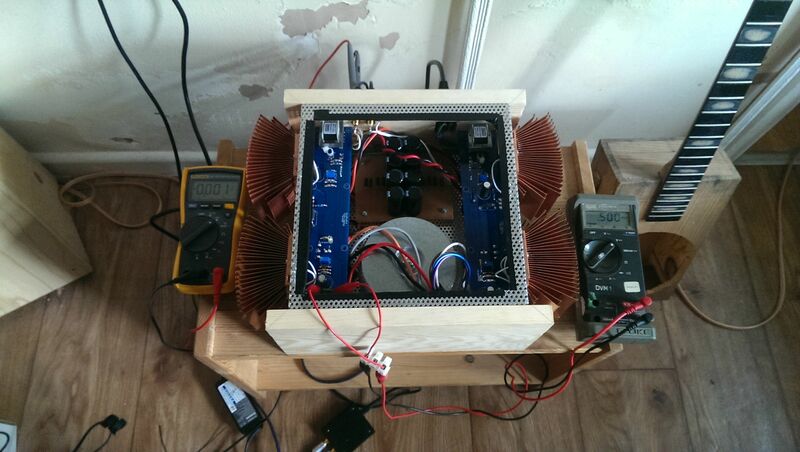 With the heatsink before they were splayed, the bias and offset values drifted up and down quite a lot. With adequate heatsinking, the values are much more stable. Mostly done :) Just forever-tweaking to complete.